I just finished this book. Now I'm sitting back in my chair staring at it, wondering what to say. My fingers are clicking the keys and I really don't know what words are going to come out. I'm listening to Chris Rice's song Missin' You. It came on "coincidentally" just as I sat down to type. I hit repeat on the music to hear the song again. What if you had a chance, here on earth, to see your life as it really is? By that I mean, what if you had a chance to view your life the same way God does? Each day we are given opportunity to choose Heaven or Hell. Each choice we make effects our life and our behavior. Each event pushes us close to the edge of one or both. Life is a battle that goes beyond the cartoon of the devil perched on one shoulder and an angel on the other. Both sides - both forces - are whispering our ears. One is mean and gruesome, the other patient. Both are violent in their passion. Neither one is avoidable or willing to concede defeat. The difference between the two is that one acknowledges victory and the other side pretends it. Alcorn does a marvelous job telling the story of businessman Nick Seagrave who is battling his own hell. Edge of Eternity is a modern day retelling of Pilgrim's Progress and, I think, to this modern audience, far more applicable. It's definitely adult in nature. Whereas you can read Pilgrim's Progress to the youngest of children, I'd hold back Edge of Eternity for a few years yet. I don't really know what to say about this book, quite frankly. Alcorn's style speaks to me. I really appreciate his work. He makes life a little bit more clear through his writing. I like this book just like I like his others. It's both meaningful and gripping. I think he's the only author who has the ability to make me truly long for Heaven. Don't misunderstand. I'm glad that's where I'm headed but Alcorn has the ability to paint such a picture that I'd be willing to go NOW. That is, I'd go now if it weren't for my family. =) Heaven is going to surpass Alcorn's representations but I thank him for the taste of it all the same. This book cannot come more highly recommended by this blog poster. Because I appreciate Alcorn and his ministry so very much, this is one book that I would say to go and buy it brand new. Usually I try to find books used but not Alcorn's. To buy the book new is to support the author and I'm all for that in this instance. For more information about Alcorn you can visit his website at: www.epm.org or click here to visit Eternal Perspective Ministries. I read this several years ago, and I had the same reaction you did. Your review makes me want to read it again. I'm reading Mr. Alcorn's Heaven for Kids aloud to my four kiddos right now, and it is wonderful! OTOH, I enjoyed *Heaven* very much. I think Alcorn has some great things to say. I just prefer reading his non-fiction. QOC - Actually, the beginning of EofE IS muddled. It was a little surprising and I was trudging through it. Then our pastor mentioned in his sermon what the Navigators use as a picture to explain "crossing the chasm" which made the book make sense. I literally had to force myself through this book. However, when I finally finished it and put it down, it meant something. It is NOT good writing. But it does speak all the same. I enjoyed Safely Home and Deadline far more. But this one had an interesting message and focusing on THAT part -- I have to highly recommend it. 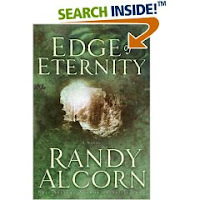 I've heard lots of good things about Randy Alcorn, but I've never read anything by him. I can relate to what you say about Heaven... Maybe I should check this out. I just finished this book, and miss it :( I want the characters to keep going! At first, through the first three chapters... I did not like it at all, but my husband did so we continued reading. By the 6th chapter, I was committed. A few of my girlfriends and I are thinking of starting a Bible study, and I'm considering using this book along with the scripture it correlates with - would love yoru thoughts on this! (I am very for reading fiction and talking about it and referencing it alongside scriptural principles. I just have a hard time basing a whole study around it. Does that make sense?) Interesting thoughts for this morning!